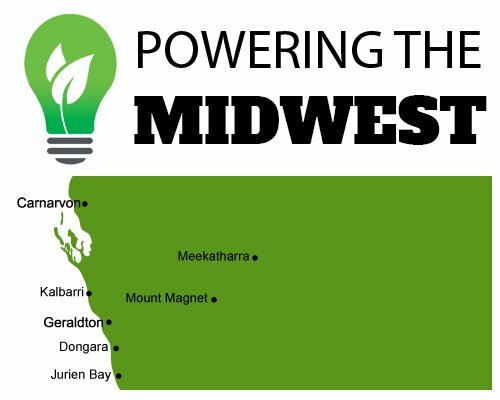 Midwest Solar Power can install, repair and maintain any solar system across all of the midwest of Western Australia. From small residential solar systems in towns like Jurien Bay to large industrial solar systems in Carnarvon. We also travel to remote areas such as Mount Magnet or Meekatharra, and have a lot of experience installing systems on all types of farms. We are happy to come out bush and spin a yarn and love to hear of the old ways, and our customers are happy to learn of new innovations that can help with their comfort of living. Midwest Western Australia is one of the best places in the world for sunshine, and of course solar power systems. With most areas receiving at least an average of 8 hours of sunshine a day, your new solar panels have the potential to collect a huge amount of energy. Below are some statistics for some of the larger towns in the Midwest of Western Australia for daily global solar exposure, and the number of clear and cloudy days, based on data from the Bureau of Meteorology. The average amount of daily global solar exposure in Carnarvon is 6.1kWh per square metre. The average number of clear days in Carnarvon is 211.2 and the number of cloudy days is 49.4, with the remainder being partly cloudy. The average amount of daily global solar exposure in Kalbarri is 5.9kWh per square metre. The average number of clear days in Kalbarri is 185.9 and the number of cloudy days is 59.9, with the remainder being partly cloudy. The average amount of daily global solar exposure in Geraldton is 5.7kWh per square metre. The average number of clear days in Geraldton is 108.1 and the number of cloudy days is 57.1, with the remainder being partly cloudy. The average amount of daily global solar exposure in Dongara is 5.7kWh per square metre. The average number of clear days in Dongara isn’t listed on the Bureau of Meteorology website but would be very similar to Geraldton. The average amount of daily global solar exposure in Jurien Bay is 5.6kWh per square metre. The average number of clear days in Jurien Bay is 128.7 and the number of cloudy days is 107.4, with the remainder being partly cloudy. The average amount of daily global solar exposure in Mullewa is 5.8kWh per. The average number of clear days in Mullewa is 147.2 and the number of cloudy days is 60.8, with the remainder being partly cloudy. The average amount of daily global solar exposure in Mount Magnet is 5.8kWh per square metre. The average number of clear days in Mount Magnet is 164 and the number of cloudy days is 70.2, with the remainder being partly cloudy. The average amount of daily global solar exposure in Meekatharra is 5.9kWh per square metre. The average number of clear days in Meekatharra is 188.7 and the number of cloudy days is 65.3, with the remainder being partly cloudy. *Data taken from the Bureau of Meteorology website. Daily Global Solar Exposure data is a mean average taken from at least 10 years of statistics. Clear and Cloudy days data is taken from at least 20 years of statistics.